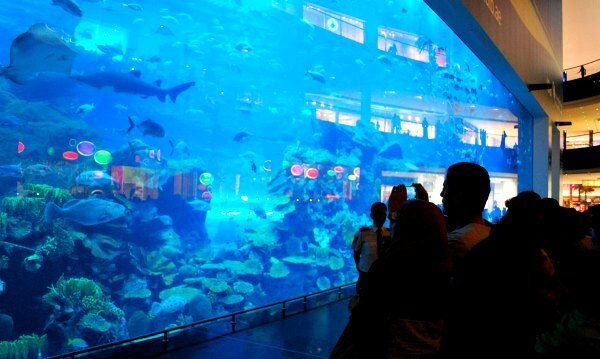 Dubai Aquarium is located amongst the shops at Dubai Mall. One minute, you’re looking in windows selling designer goods and the next you’re confronted with a huge glass wall behind which, all kinds of sea life are swimming around together. It’s an amazing sight and it’s free to stand outside and watch. If you decide to pay the admission fee though, one of the best bits is the 48 metre walk-through tunnel. Also here is a mini underwater ‘zoo’ with creatures like penguins. Even the basic ticket also includes a ‘behind the scenes’ tour and although it’s only a 10 minute introduction, it’s still worth doing. The underwater zoo is split into three zones – Rainforest, Rocky Shore and Living Ocean. 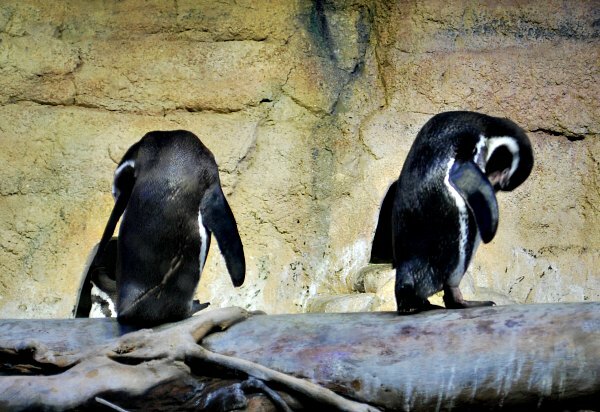 In the zoo you’ll find Otters, Piranha, Humbolt Penguins, Caiman Crocodiles, Lionfish, Giant Spider Crabs, Seahorses, Garden Eels, Archerfish, Arapaima, Water Rats, Paddlefish, Cichlids, Nautilus and more. Each of the species is housed in one of 40 separate aquatic displays. There’s also a UAE Night Creature section with Fruit Bats, Arabian Toads, Giant Camel Spiders, Scorpions, Veiled Chameleons, Frog Eye Geckos, Ornate Spiny Tail Lizards and Cheesman’s Gerbils amongst others. The Aquarium has lots of additional experiences that you can pay for should you wish, like riding in a glass bottomed boat, cage snorkelling and scuba shark dives. To be honest, we felt we saw enough of the main aquarium from the outside and through the tunnel without the need to actually go in it, but the options are there. When you go on the ‘behind the scenes’ tour (pictured below) you’ll hear how they deal with poorly fish, what they feed the fish and how the diving operates. Just in case you’re wondering when you see all the different fish in the food chain swimming together, they don’t eat each other simply because they’re so well fed. The Dubai Aquarium and Underwater Zoo is open daily from 10am closing at 10pm on weekdays and at midnight on weekends. 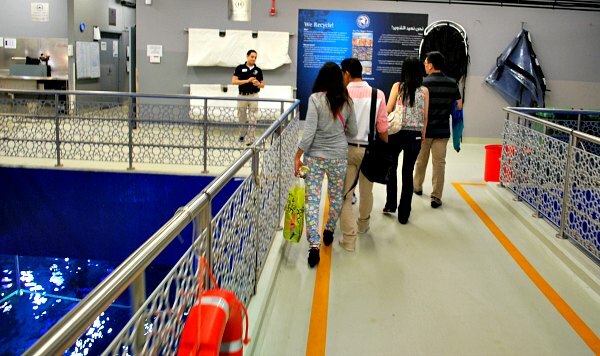 A basic ‘Researcher Experience’ is 100 AED (2016 prices) which includes the Underwater Zoo, the Aquarium tunnel and the behind the scenes tour. 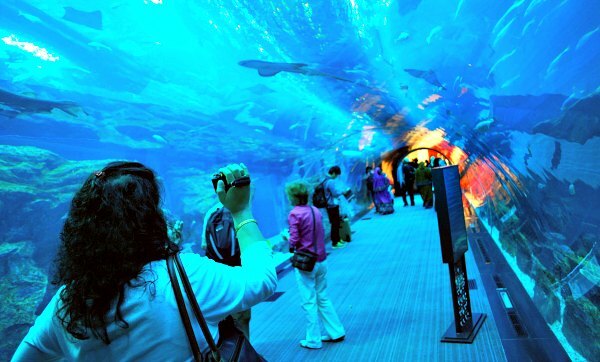 The aquarium is inside Dubai Mall which has its own stop on the Dubai Metro. There is a covered air-conditioned walkway from the metro station to the mall.